When using sprockets, sometimes have to use "require_self". 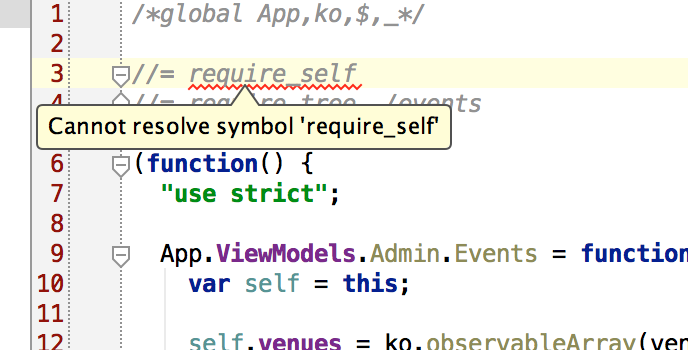 However, it always shows as an error on RubyMine with "Cannot resolve symbol 'require_self'". As such, the file is showing in error, but it is perfectly fine. Any ideas how I can just have RubyMine ignore this? Thanks for the response. 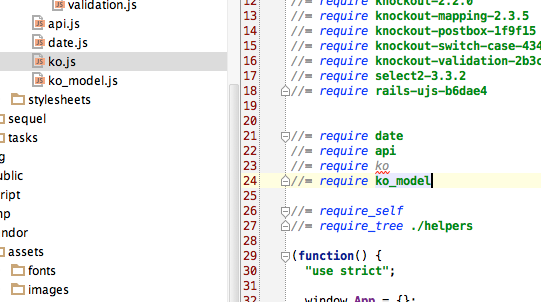 Upgraded to the latest EAP, now seeing a different error, this time with "ko.js" and requiring "ko". Seems that it sometimes does not find other files that I require. See screen shot attached. Is there just a way to tell RubyMind to ignore this on a case-by-case basis? I know the file is there, I just want RubyMine to accept that it is. I can't see the error message on the screen shot. Does it say that "ko" is a typo? Also could you navigate from require "ko" to related file? The error says "Cannot resolve file 'ko'". Wierd thing is that if I rename the file something else besides "ko", like "ko_thing", and change "require ko" to "require ko_thing", it works. It just seems to have a problem with naming it ko. Not sure if this is a simple issue, but again, might be great to let RubyMine know to just ignore errors like this, just in case somethign pops up.